We are dedicatedly involved in providing an excellent quality array of Dome Printed Stickers, for catering the various needs of our clients. 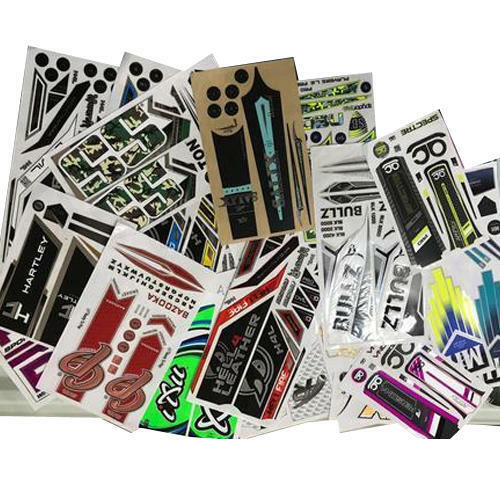 We “Creative Edge Labels Private Limited” have gained success in the market by manufacturing, trading, wholesaling and exporting a remarkable gamut of Cricket Bat Stickers, Adhesive Stickers, Plastic Nameplates, Hockey Stickers, etc. We are a well-known and reliable company that is incorporated in the year 2018 at Jalandhar (Punjab, India). Our offered products are manufactured in compliance with the pre-defined industry norms and tested to ensure their flawlessness. Range of products offered by us is Stickers for Sports Industry, Stickers for Electrical & Electronic Industries and Stickers for Footwear Industry. Apart from this, we also export our products to UK, Australia, South Africa, New Zealand, Pakistan, America and Sri Lanka. We are a renowned firm that is managed under the supervision of “Mr. Pankaj Sharma” (Director), and have gained huge clientele. As an organization, we are managed professionally and take care of quality parameters while designing each one of our products. Each and every product offered by us is prepared from quality raw material and are tested as per different specifications. To carry on with all our quality testing activities, we have employed a complete team of efficient quality professionals at our place, who help us by conducting stringent tests at each stage of product development. When it comes to understand the competitive advantages of our company in global arena, our large product line, effective R&D activities and OEM (Original Equipment Manufacturing) abilities defines us as an organization. In making these happen, a team of professionals dedicated towards the organization acts as a support system to us. Among these our R&D people take care of different scopes of product designing, development, innovations and market research. We are also supported by our infrastructural set up, which is incorporated with latest facilities for printing. Latest machines and facilities of quality testing available in-house, we are able to act as one stop shop, with the ability to deliver best range of products. One can avail facilities like concept creations and also complete solutions of designing them from us at minimal prices. Our innovative ideas act as one of the best help in doing a class of business by satisfying all types of clients’ requirements.